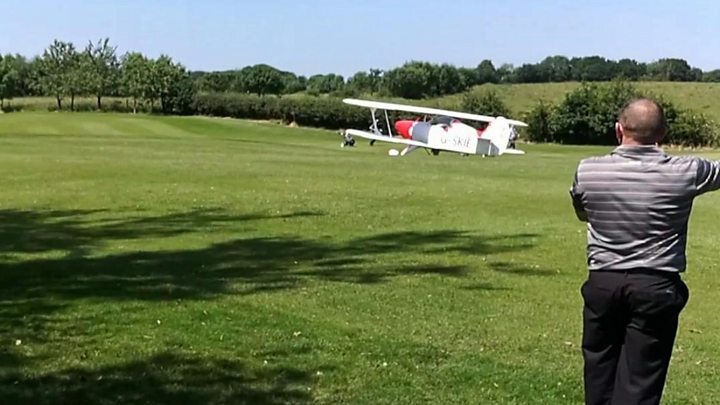 A pilot who had to make an emergency landing on a golf course in his biplane said it was the kind of "in-flight entertainment you really don't want". Dave West was filmed landing the plane on the 15th fairway at Westhoughton Golf Club on Saturday. The pilot was forced to make the landing when his plane developed a mechanical problem. One golfer was heard shouting "what a driver" when his plane touched down. Mr West told the BBC: "My options seemed quite limited at the time. "The engine developed a real rough running, a real knocking and banging on the engine and it lost power." He said he was unable to maintain height and "it was reasonably clear" he would not make it back to the airfield. "I flew for probably a minute or so looking for fields and trying to find something that would be suitable to land in and safe to land in and losing height all the time before I saw the golf course, " Mr West said. "The 15th fairway was beautifully aligned into wind. "I did pick a fairway that did look as if it didn't have as many golfers on it. And I have to say the club were brilliant." He added: "Yeah, in-flight entertainment of the type you really don't want." An air ambulance passing overhead at the time also landed on the fairway to provide help but the pilot was uninjured.